We are not sending spellings home this week. 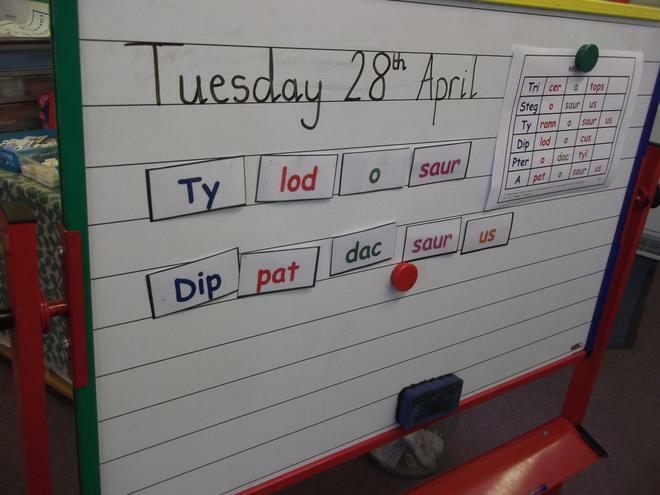 We would like you to practise letter sounds and using 'Fred Talk' to read words. 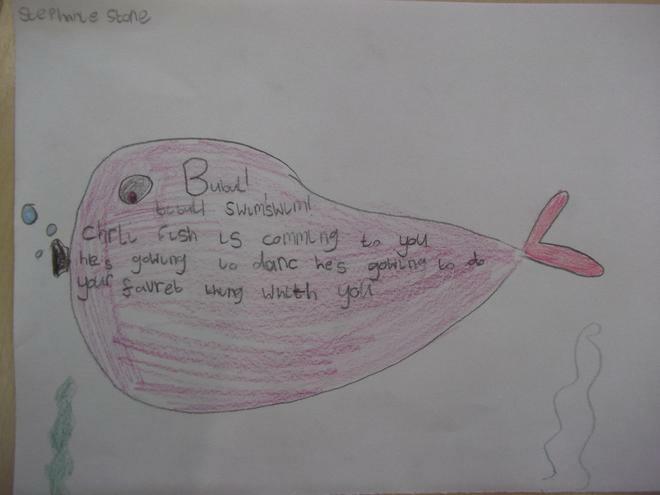 This week we have been writing a fantasy story. Our teachers are very impressed with our stories. We have been finding out about dividing into halves and quarters. This week could you practise cutting objects (such as sausages, potatoes, cakes etc) in half and into quarters. 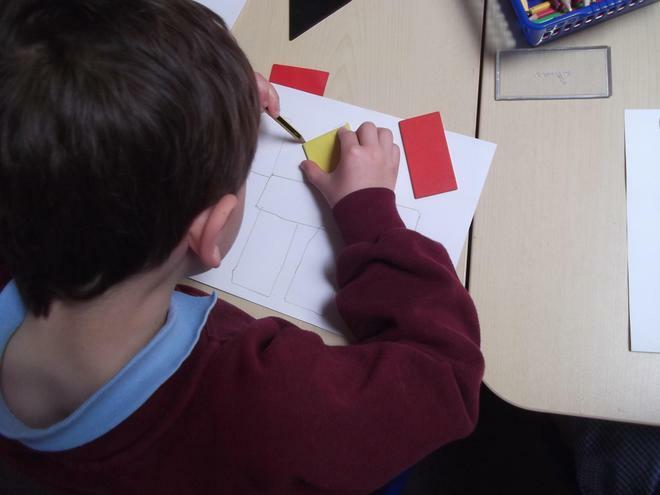 We have been creating dinosaurs using 2D shapes. 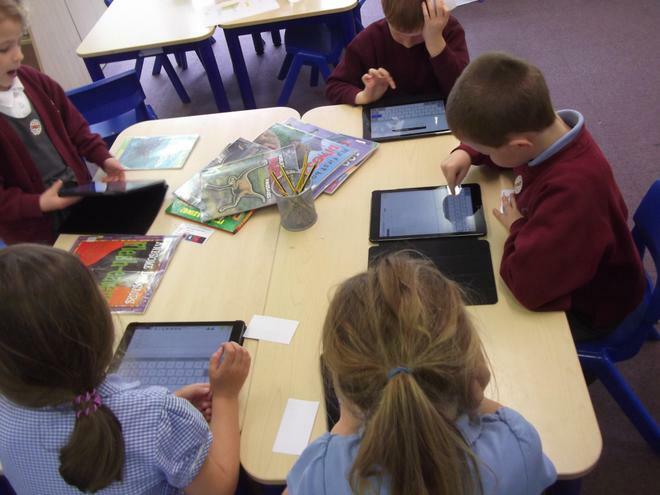 We have been using the ipads to create information leaflets about dinosaurs. 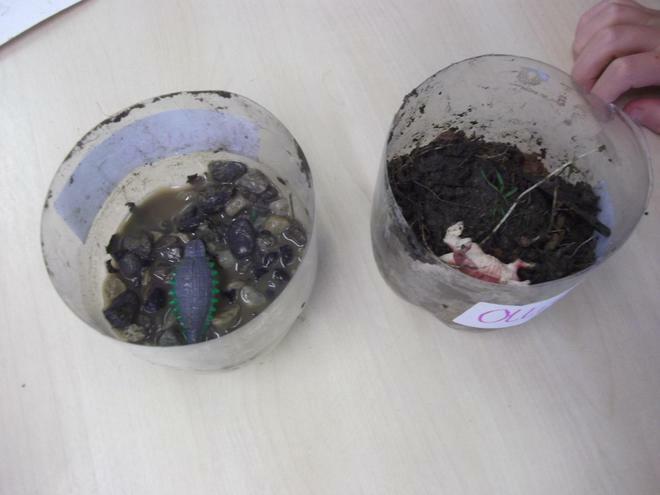 We have been creating our own dinosaur world in bottles. Happy half term. Enjoy your break. 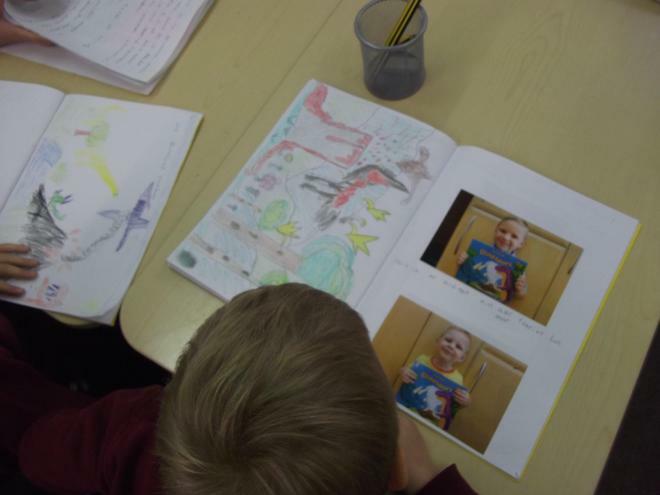 We have also enjoyed sharing our homework. In literacy this week we have been learning about tenses - Uncle ed and Auntie ing (jumped, jumping). 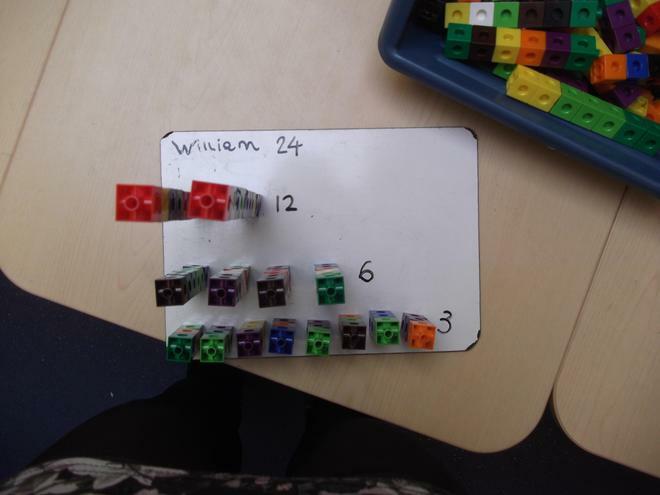 In numeracy we have been sharing by 2 and by 4 e.g 6 shared by 2 and 12 shared by 4. 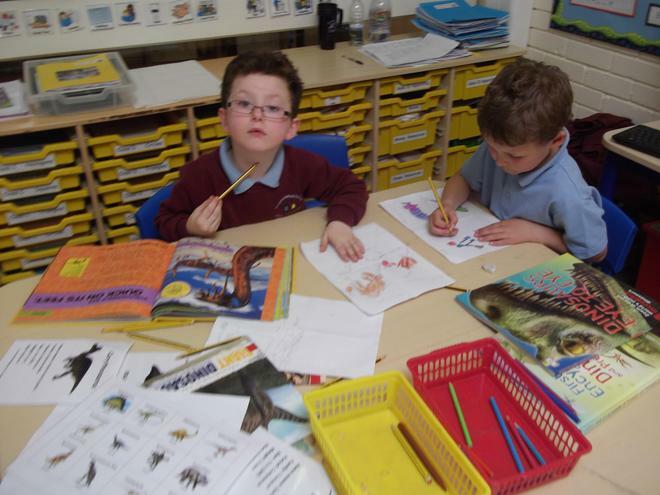 In topic we have been sorting dinosaurs into carnivores and herbivores. 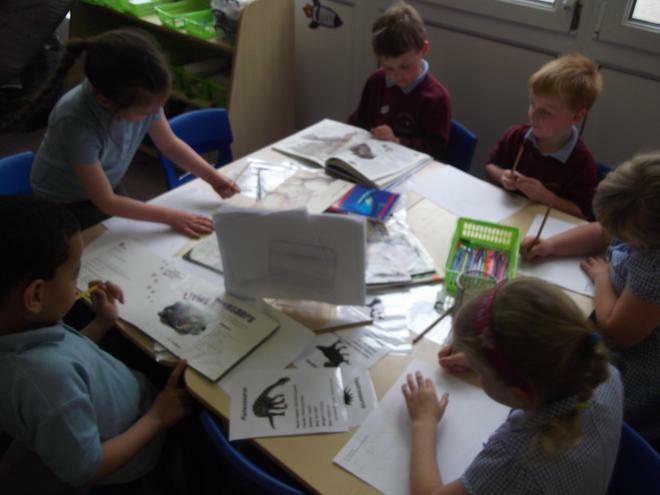 We have done some observational drawings of fossils. 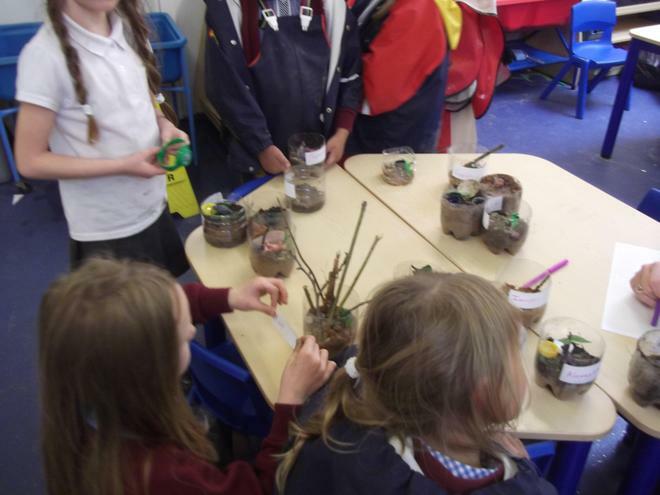 We also learned how dinosaurs defended themselves against attack and made some dinosaur masks. 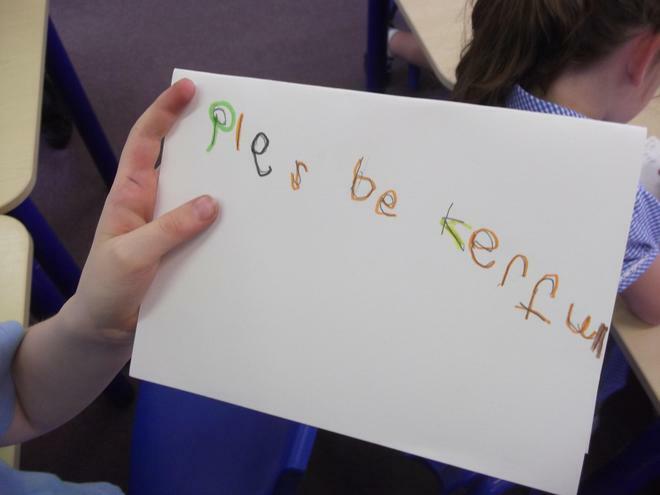 Please continue to practice yor phonics sounds, thank you. In Numeracy we have been multiplying! Our teachers are very proud of us! 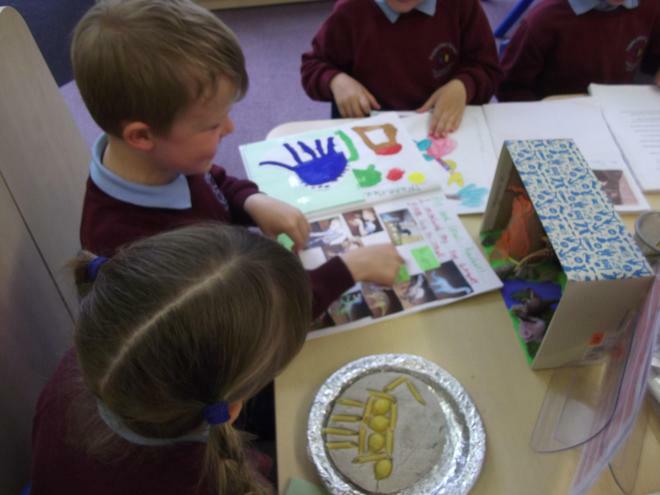 First we discussed what things are usually in pairs – feet, hands, ears, eyes etc. Then we stood 5 children at the front and had to work out: How many feet altogether? Our teachers told us this is a repeated addition. 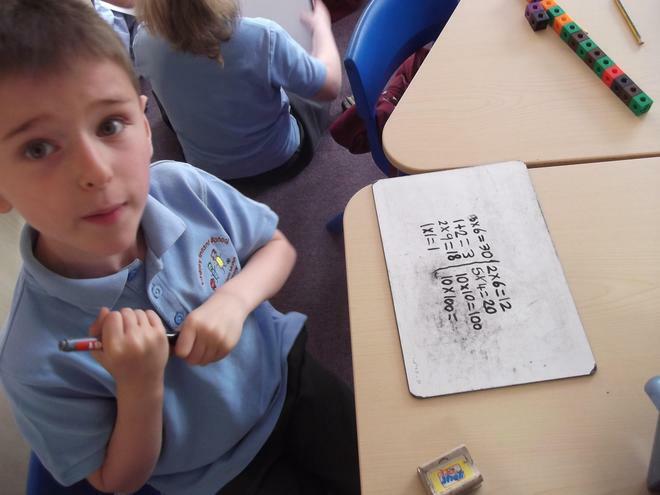 We then talked about how this is a very long way to write and a quicker way is to use the x sign. This means multiplied by. How many twos are there? 2 multiplied by 5 or two, five times. Can we practise multiplying this way at home? 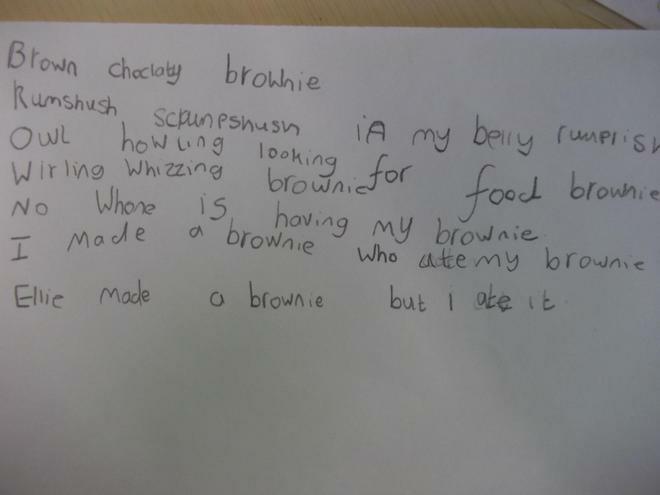 In Literacy we have been creating acrostic poems and shape poems. 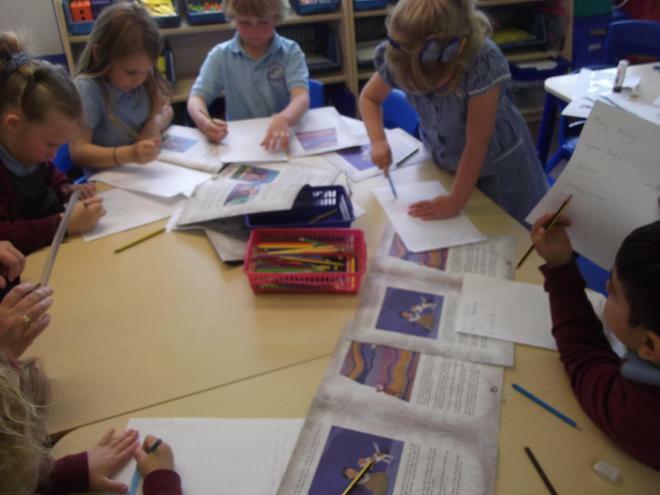 We have been finding out about Mary Anning. Can we research her at home? 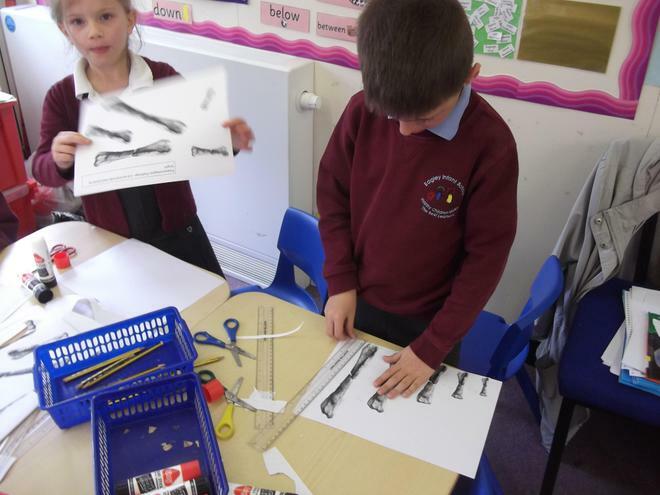 We have been measuring dinosaur bones. 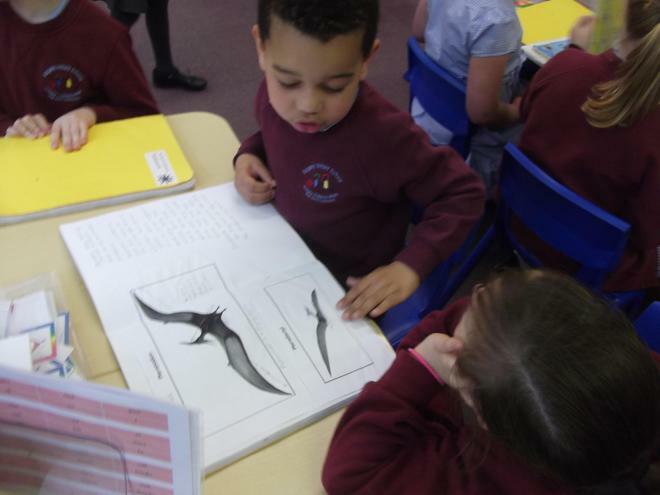 We have been watching clips of dinosaurs and discussing animals they are similar to. 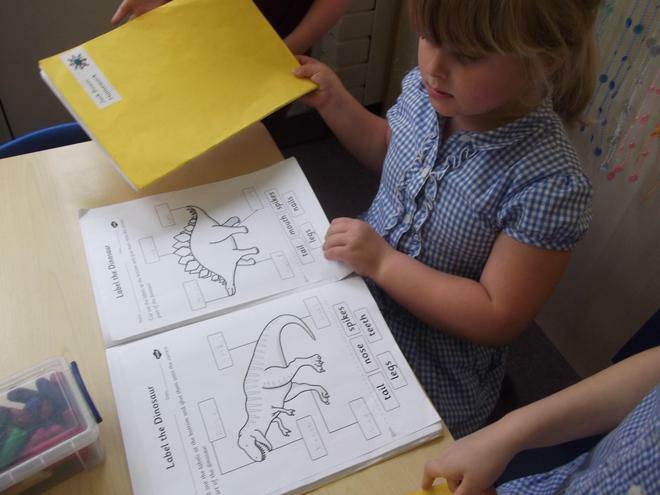 We think that a Diplodocus is similar to a giraffe because they both have long necks. 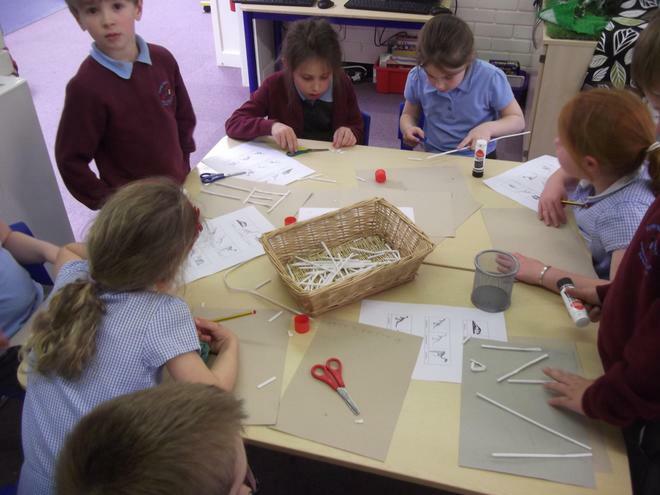 We have made dinosaur skeletons using art straws. 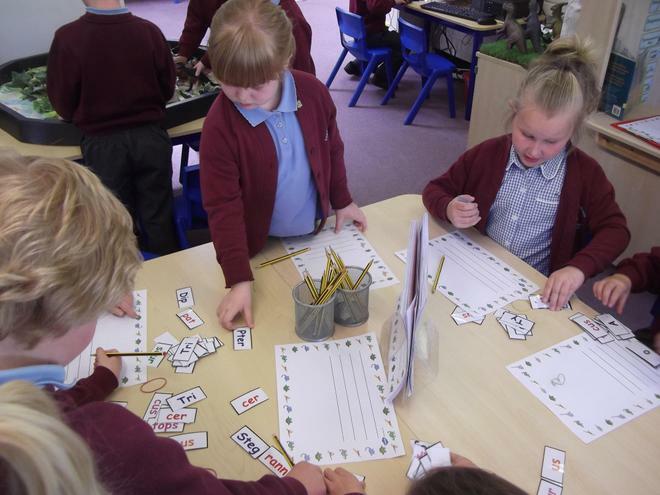 In Numeracy this week we have been using directional language. We used directional language to move the Bee-Bots around the mat. If you pretend to be a robot we will give you directions to move you around! 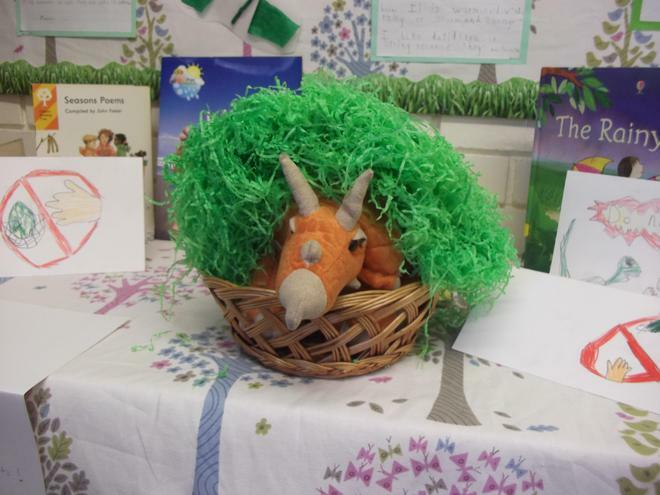 In Literacy we have listened to a traditional story from China called the Dragon Dinosaur. 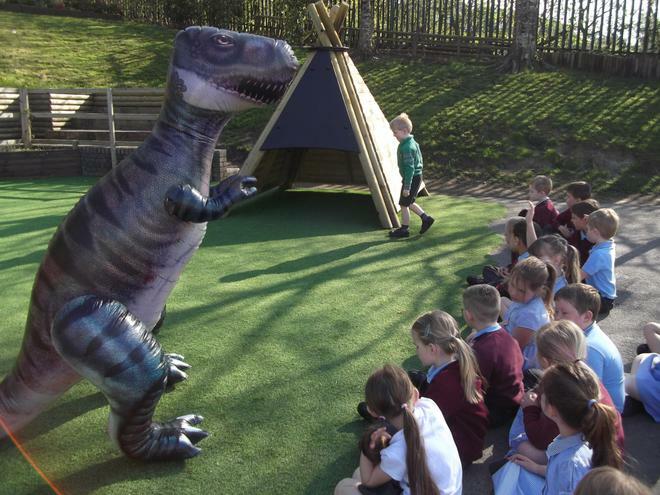 We had to imagine that an enormous dinosaur was going to attack our school. We had to describe a fierce animal who we could ask to help! The egg we found last week has now hatched! We have been trying to think of a new name for him. 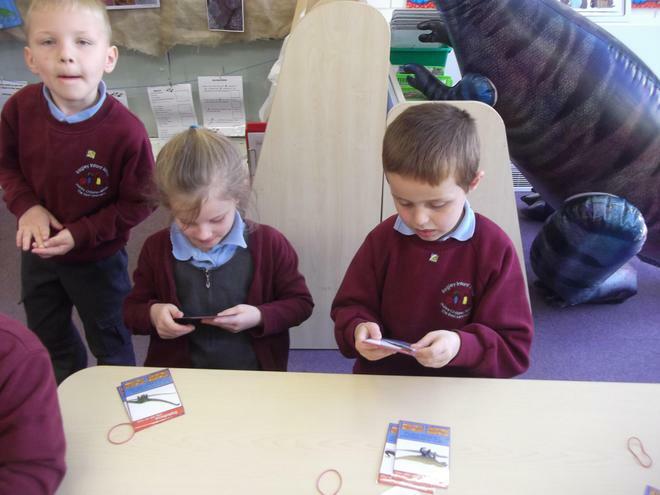 We have been playing dinosaur top trumps. 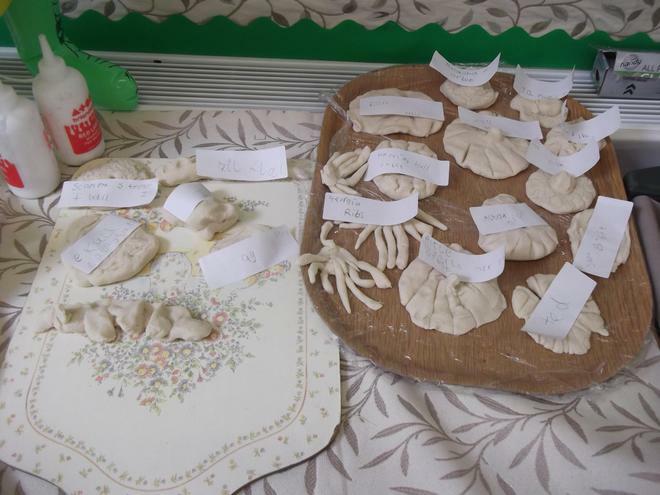 We have been making our own fossils. 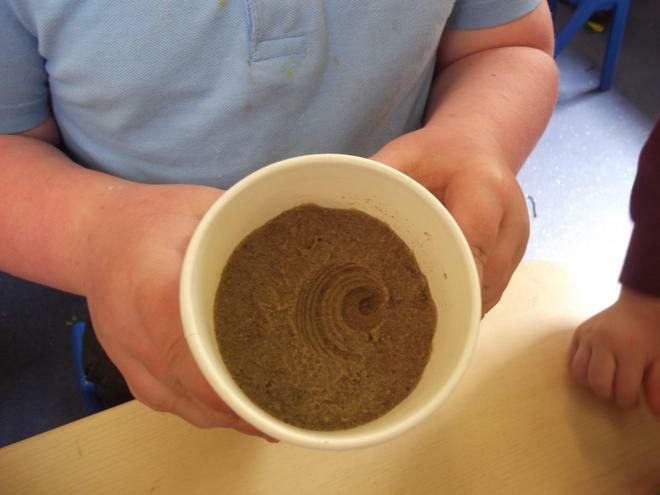 We put wet sand in a pot and pushed in a shell. 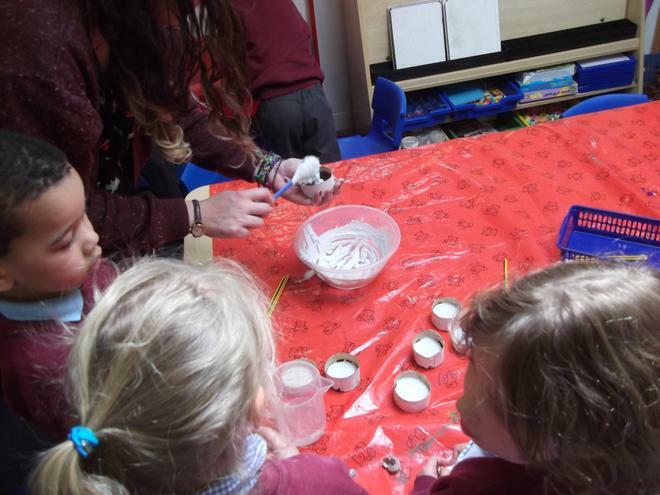 Then we poured plaster of paris in. 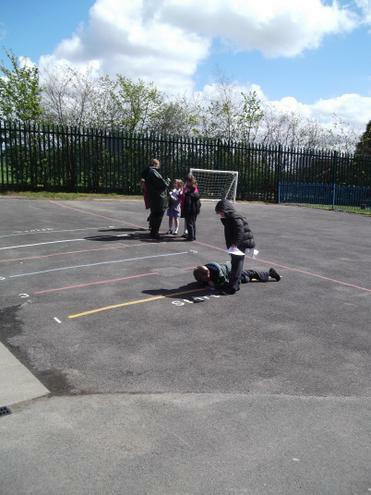 We have been using the playground to measure how long the different dinosaurs were. 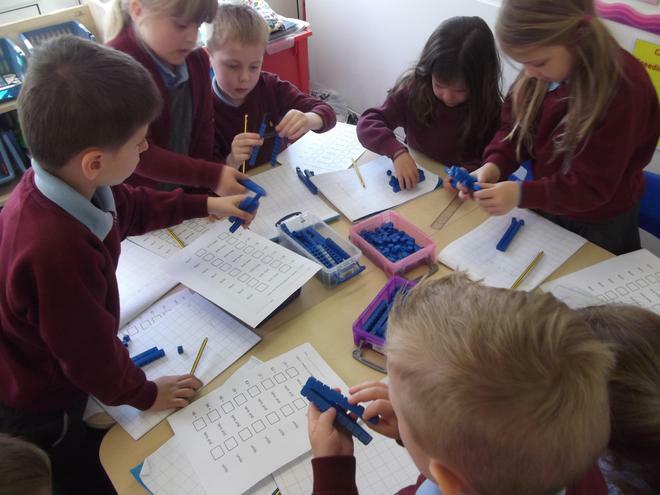 In Numeracy this week we have been partitioning 2 digit numbers. We are getting really good at it. 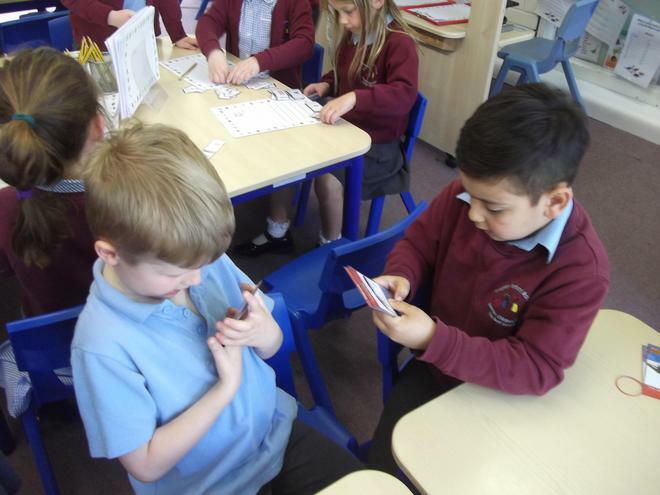 We can tell you how many tens and how many ones (units) are in a number, just ask us and we'll show you! 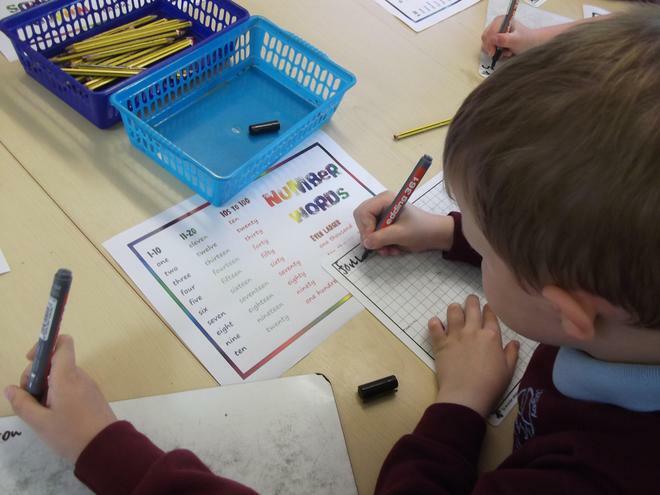 We have also been learning to write the number words to twenty. Can we practise at home? 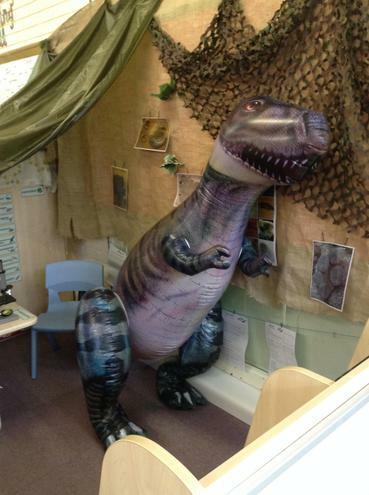 In Literacy we have had a rather large visitor! A dinosaur has decided to come and stay with us for a while! We think he's a boy and we have decided to call him Donald. Donald has taught us how to move like different dinosaurs. We have been swaying, stomping, flapping, swooping and crunching. 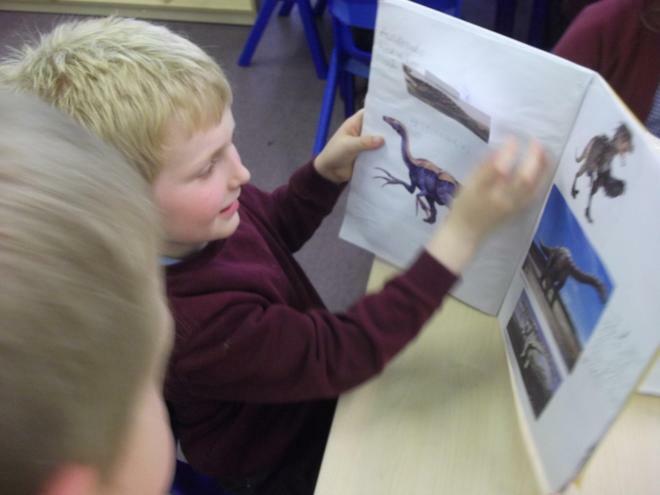 We have also read a story about dinosaur and been describing them. 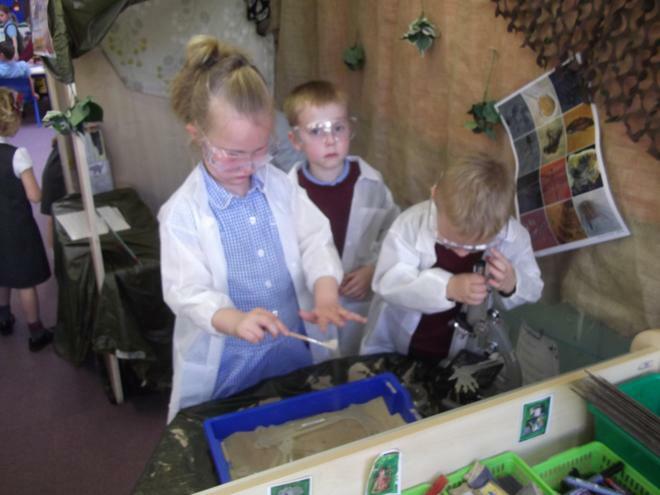 Our Dinosaur Dig is now open so we have been pretending to be palaeontologists! 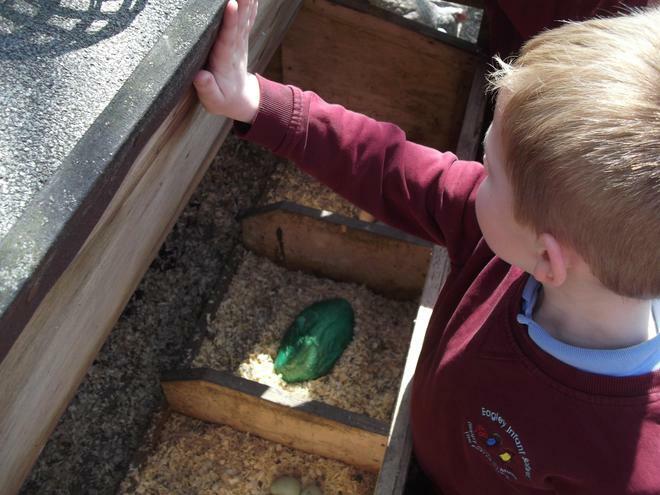 In Topic we found what we think is a dinosaur egg in the chicken house! We have put it in our classroom and made signs to keep it safe. 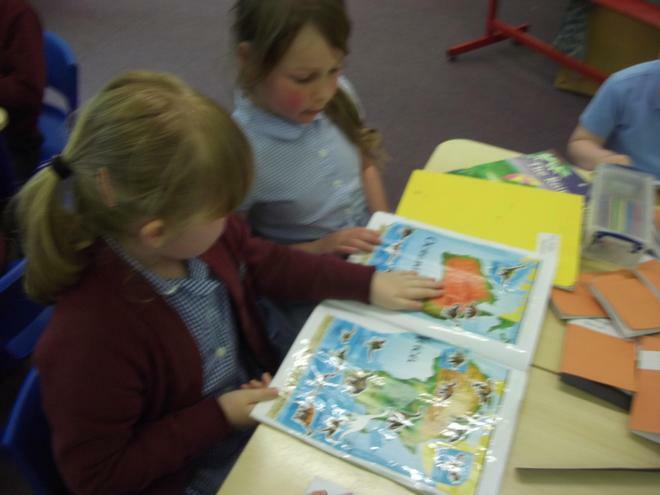 We have been using non fiction books to find out facts about dinosaur. Maybe at home we could look on the internet together to find out more. 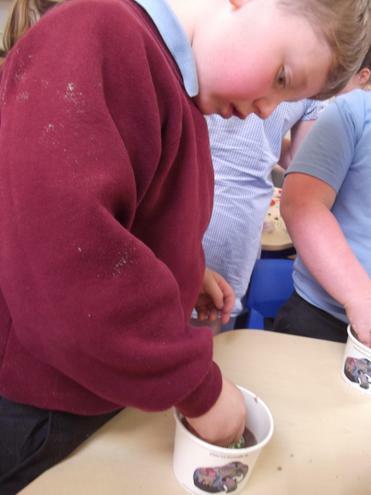 We have been making our own dinosaur bones out of salt dough. 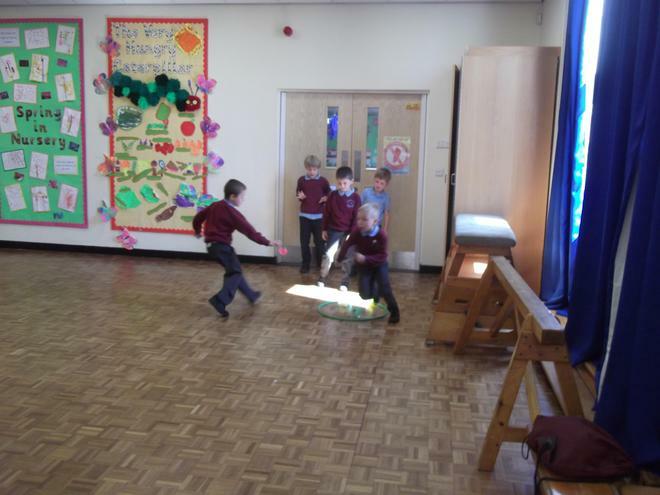 We played a game where we had to steal eggs from other dinosaurs nests.